Disclosure: I received a complimentary copy of the Erin Condren Monthly Bill Tracker Dashboard for purposes of this review. All opinions are my own. 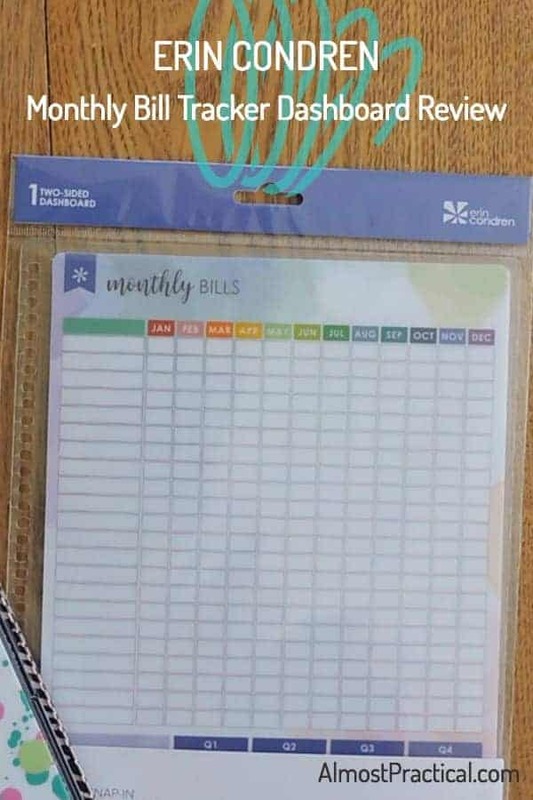 I also honestly have to say that this bill payment organizer is one of my favorite Erin Condren accessories. In a rush? CLICK HERE to go directly to the Erin Condren Monthly Bill Tracker Dashboard. If you are anything like me, you probably have had a few close calls with missing deadlines when it comes to paying bills. Paperwork has a funny way of just piling up and if you don't stay organized and on top of things – you just might miss something important. Even if you use an to do app on your phone or have a special online calendar to help you with your finances, it is still good to have that visual reminder that something is due or be able to see at a glance whether it has been paid. Here is an easy way to keep track of your bills – offline. Over the years I have tried many different methods of keeping track of my bills. Paper calendars, notebooks, spreadsheets – you name it. All I needed was a simple visual representation of which bills were paid and which ones were not. If I had to fire up a spreadsheet or do something complicated, I would probably put it off and never get to it. Likewise with using a flimsy sheet of paper or burying my notes deep in a notebook. So, when I saw this bill payment organizer from Erin Condren, I knew I had to give it a try. 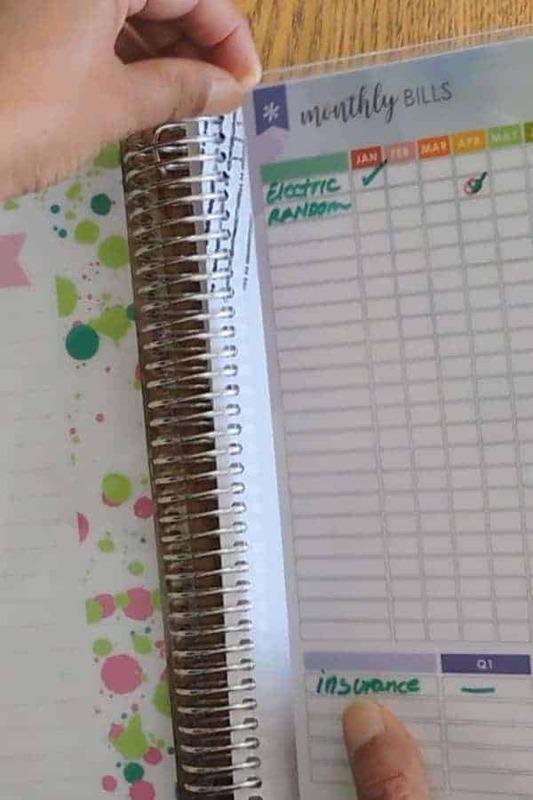 What I loved right away was that it was a laminated card that snapped right into my Erin Condren Deluxe Monthly Planner (it also fits into the Erin Condren Life Planner). Because the Monthly Bill Tracker Dashboard is laminated, you can use wet erase markers or dry erase markers to keep track of your bills. Both of these are erasable which means that you can use the card over and over again. You can also change your strategy mid year, should you decide to change directions. The lamination also makes this bill payment organizer a bit more substantial than a random piece of paper that you might lose. I find that I start lists and notes with the best of intentions and forget all about them, only to start over again in a different place. So, I like the “permanence” of this laminated card that snaps right in to my planner. I know where to look when I need information about my bills and I remember to check off the bills that I pay monthly. The Erin Condren Monthly Bill Tracker Dashboard also sports a very useful layout. You list your recurring bills down the left hand side and the months of the year run across the top. This creates a grid of boxes that you can check off as you pay your bills each month. This is not a complicated spreadsheet or a checkbook where you would keep track of amounts or anything like that. You simply check the box if you paid the bill. Across the bottom of this bill payment organizer you will find space to record quarterly or yearly bills. You can also use different colors of markers to completely customize how you use the organizer. For example, you can use a red circle to show that a particular bill is due in a specific month. then you can use a green checkmark to show that you actually paid it. This strategy is great for bills that don't happen every month or that are paid at irregular times throughout the year. Really you can make it your own. I have a feeling that I will mostly be using the front side of this bill payment organizer – but I do want to mention the flip side. On the other side of the card is a handy savings tracker. 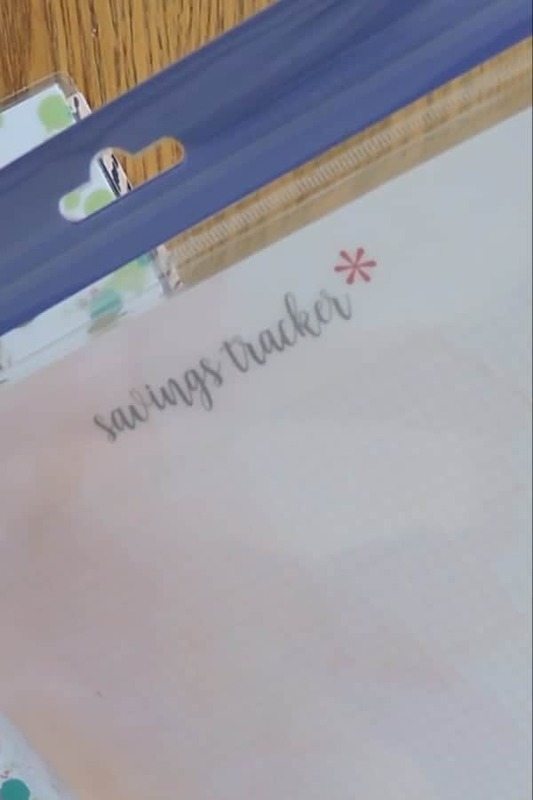 You can use this to track your savings by month or by “bucket” – savings, vacation, holiday shopping etc. 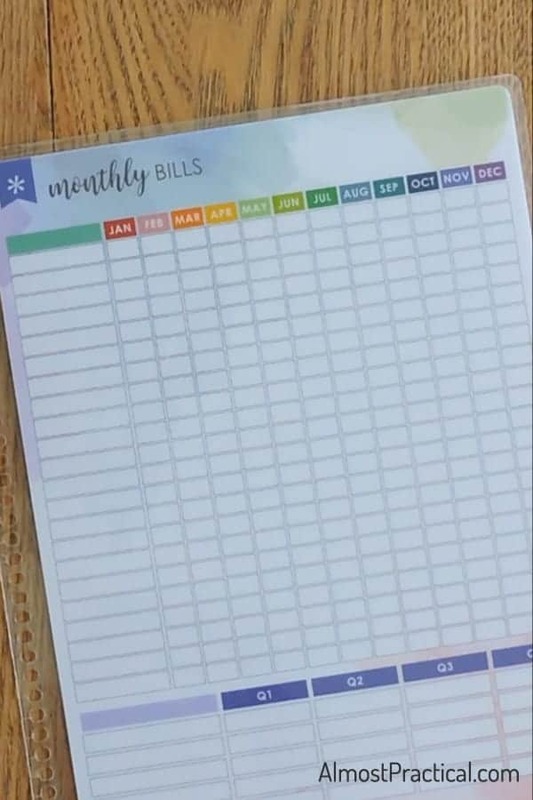 It is kind of hard to describe in so many words how the Erin Condren Bill Tracker Dashboard actually works – so I created a quick little video for you. Do You Use a Bill Payment Organizer? There are more ways than one to keep track of bills. Tell us about the strategy that works best for you in the comments below. If you enjoyed this review of the Erin Condren Monthly Bill Tracker Dashboard, be sure to use the form below to sign up for our newsletter.